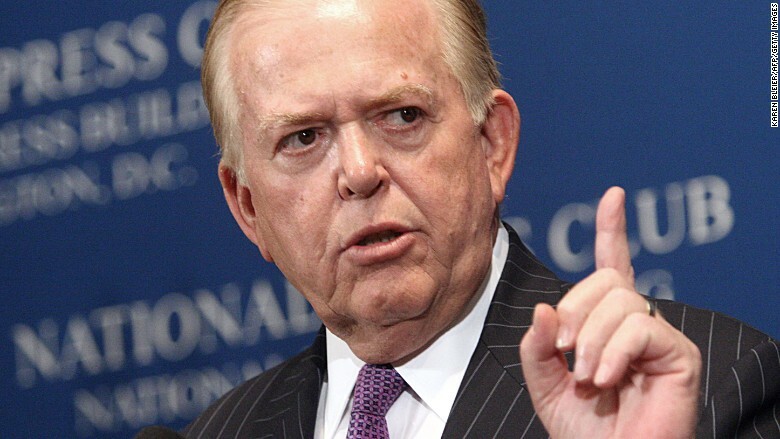 This June 26, 2007 file photo shows Lou Dobbs, then anchor and managing editor of CNN's Lou Dobbs Tonight program, at the National Press Club in Washington, DC, where he spoke about the passage of the bitterly divisive and sweeping immigration reform bill designed to offer 12 million illegal immigrants a path to citizenship. Fox Business Network host Lou Dobbs apologized Thursday for tweeting the phone number and address of a woman who accused Donald Trump of inappropriately touching her. The apology came hours after Dobbs retweeted a link to a conservative news website that claimed Jessica Leeds, a woman who spoke with The New York Times about Trump, had ties to the Clinton Foundation. "This is the Dirtiest Campaign in our History," Dobbs wrote in his tweet about the article. The article Dobbs retweeted claimed that a phone number purported to belong to Leeds had the first six numbers -- the area and exchange numbers -- of the Clinton Foundation. Dobbs' tweet included the woman's personal phone number and address. That tweet has since been deleted. Dobbs later tweeted "My Retweet, My Mistake, My Apology to Jessica Leeds." When reached for comment the Fox New Network referred CNNMoney to Dobbs' tweet. Leeds could not be reached for comment. CNN has not independently verified Leeds' allegations against Trump. Trump and his campaign have said Leeds' story is false, and a lawyer for Trump wrote to the Times saying "your article is reckless, defamatory and constitutes libel per se." The Times said Thursday it will not retract its article, adding, "nothing in our article has had the slightest effect on the reputation that Mr. Trump, through his own words and actions, has already created for himself."